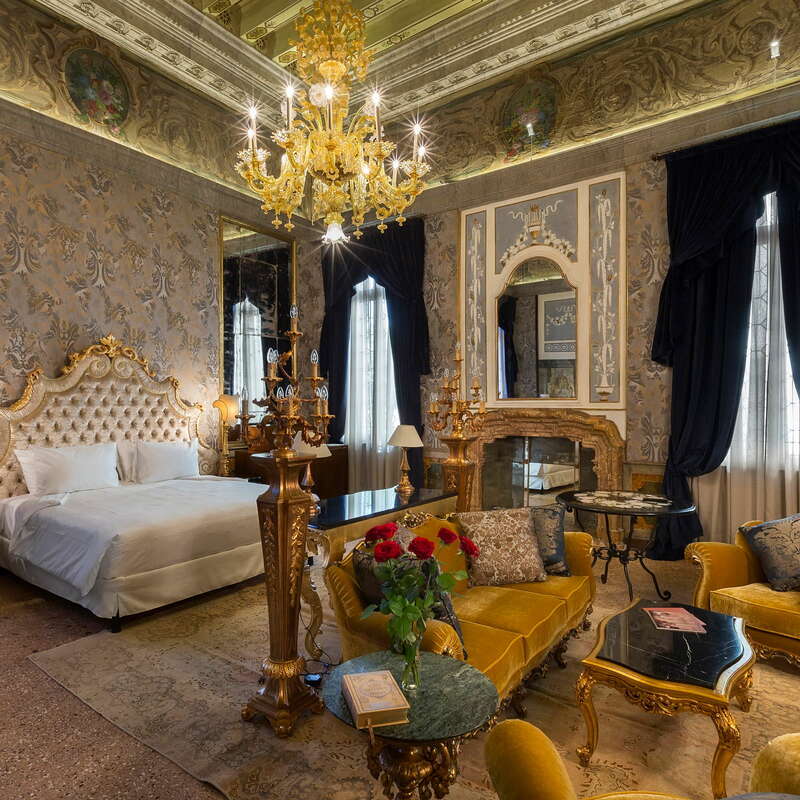 One of the newest hotels in Venice, though set inside a gorgeous 16th-century palazzo on the Grand Canal (though the quiet part of the canal, in the Santa Croce sestiere), Palazzo Venart has 18 unique and highly atmospheric rooms along with beautiful public spaces—exactly what you’d expect when you’re staying in a thoughtfully restored palace. Guests can also relax in the fab garden overlooking the water where they can drink and dine (and sail away, if they so choose). 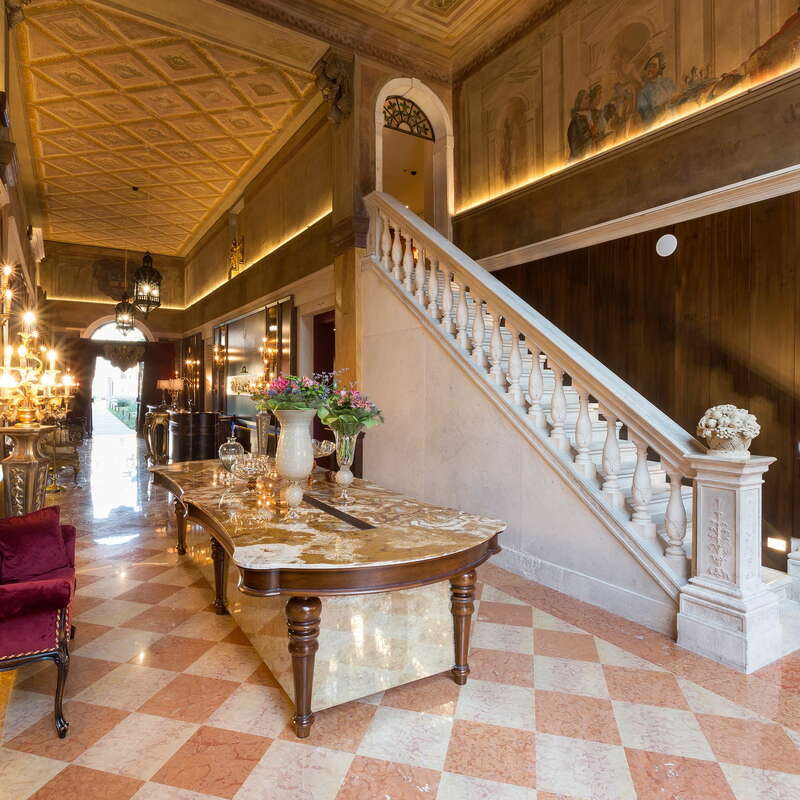 Classic rooms feature frescos, stucco walls, and Venetian terrazzo or wood floors; some include beamed ceilings and private terraces. 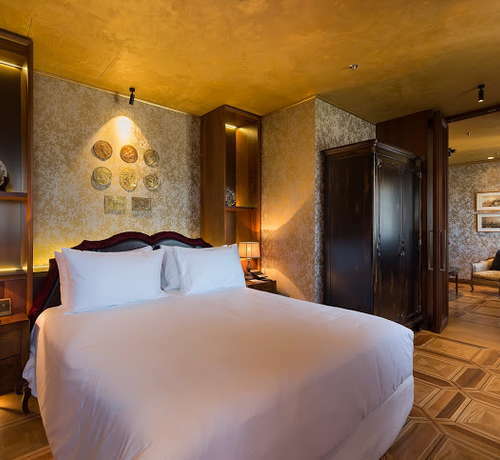 More deluxe rooms and suites are furnished with antiques and charming details. All are unique and extremely atmospheric. YOU SHOULD KNOW One of the Classic Rooms is on the ground floor, close to the reception—though it’s pretty, it can be very noisy, so best to choose a higher floor if you can. Bathrooms vary depending on your room type, though all are lovely and lined in marble. Lower category bathrooms include walk-in showers or shower/tub combos. More deluxe bathrooms have double sinks, separate baths, and canal views. ETRO toiletries, from the Milan-based fashion house, are wonderfully fragrant. The gorgeous wood-paneled lobby has terrazzo floors and painted ceilings—but there’s nowhere to sit. 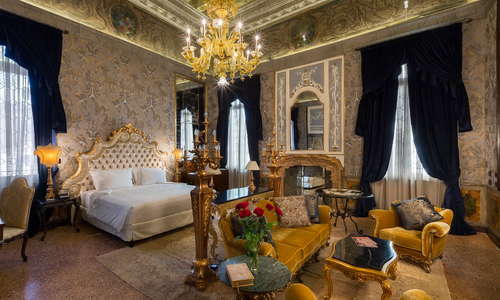 Instead, venture upstairs to one of the lavish, elaborately decorated sitting rooms where you can laze around in style. Photo: The latest creation of Michelin chef Enrico Bartolini, and his first in the Serenissima, GLAM restaurant can host up to 40 guests indoors or al fresco. 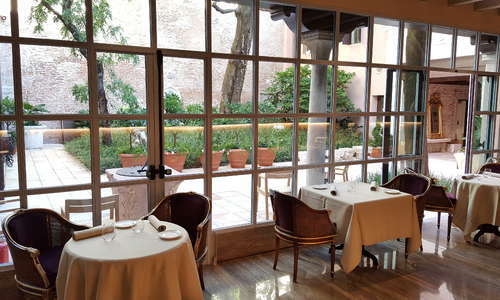 The menu at one Michelin star GLAM is overseen by famed Italian chef Enrico Bartolini—think Venetian dishes with a modern twist. Guests can dine indoors in the beamed-ceiling dining room or outdoors in the garden, with lovely water views. 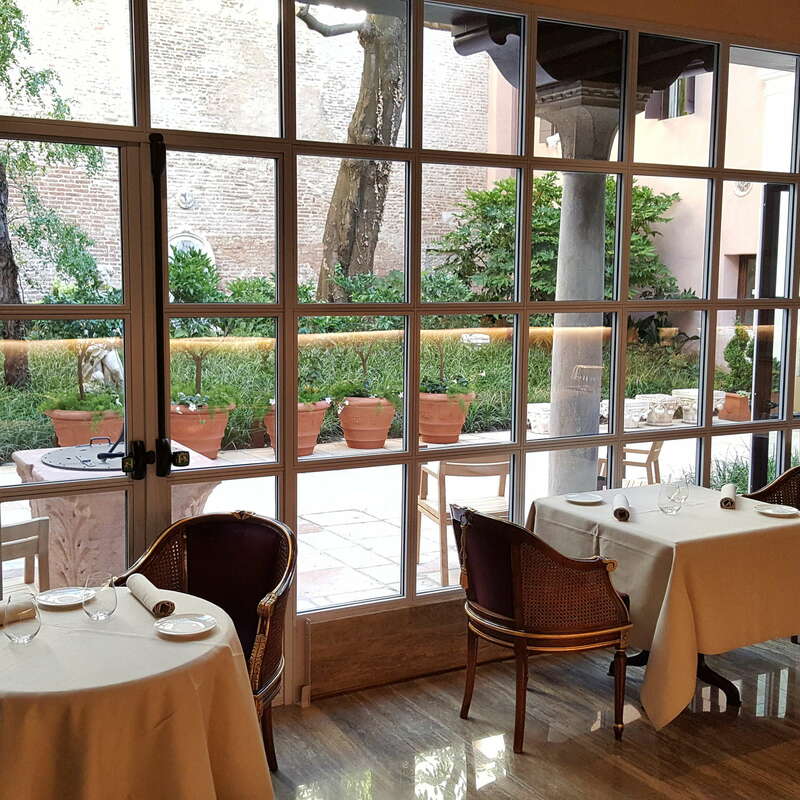 Though you can dine a la carte, the set menu of Enrico Bartolini classics is reasonably priced (as things in Venice go) for a good amount of food. Though there’s no separate bar, you can order a glass of wine or cocktail in the peaceful garden lounge, which shares space with the restaurant. Though Palazzo Venart is a bit off the beaten path, it’s only a 5-minute stroll to the San Stae vaporetto stop, from where you can sail pretty much anywhere along the Grand Canal. Otherwise, it’s a bit of a hike to prime tourist destinations like San Marco (20 minutes walk), though the Ponte di Rialto is only a brisk 11-minute walk away. It’s just a few steps away to La Zucca (1-minute walk), a vegetarian’s dream (though it also serves meat); make reservations as far in advance as you can, and don’t miss their signature flan di zucca (pumpkin flan). Antica Besseta (3-minute walk) is a great place for fresh fish and other local market specialties. Al Nono Risorto (6-minute walk), near the Rialto Market, has a pretty terrace and tasty antipasti, pizza, and seafood pasta. Al Prosecco (2-minute walk), set in a lovely square, doesn’t just serve its namesake bubbly, but also tons of wines by the glass, along with nibbles like meat and cheese. 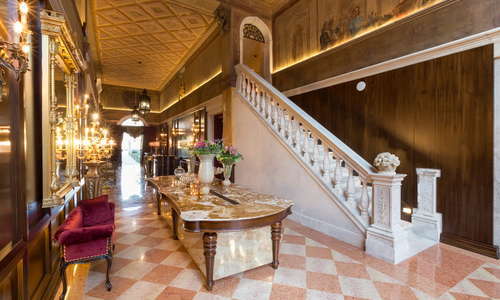 Don’t miss the snacks (called cicchetti) and wine at Cantina Do Mori (8-minute walk), the oldest bacaro (wine bar) in Venice, or try an Aperol Spritz while gazing at the Grand Canal at Naranzaria (9-minute walk). 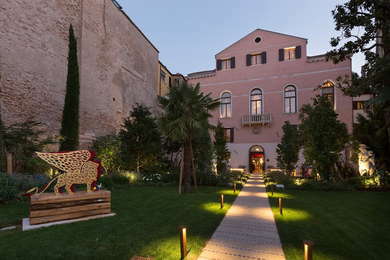 Palazzo Venart ticks all the boxes—palace location, Grand Canal setting, peaceful garden, highly regarded restaurant. It can feel more like staying in someone’s opulent mansion rather than in an impersonal hotel, and when you walk outside the grounds you’re in a neighborhood with actual locals rather than just tourists. It’s easy to get used to this kind of laidback luxury.